After living away from Philadelphia for two long years, pulling into Center City on board the Chinatown bus felt kind of magical. The weather was blustery and the skies were gray, but all that didn’t matter. I was in my old stomping grounds and it felt beyond good to be back. For our first dinner in the city, The Astronomer and I paid Tony Luke and his famous cheesesteaks a visit. The cab ride to this distant part of the city cost more than our meal, but there was no other place we’d have rather been. 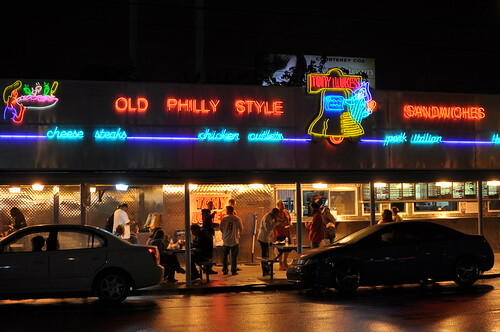 Back when I lived in Philly, I conducted a few cheesesteak throwdowns between Pat’s King of Steaks and Geno’s Steaks. My brother and I pitted the two South Philly powerhouses against one another in 2004 with Pat claiming victory. The Astronomer and I conducted a rematch during the spring of 2007 with Geno coming out on top. In the years since I’ve moved away from Philly, I’ve come to realize that both Pat and Geno are famewhores. The good stuff is at Tony Luke’s. The counter at Tony Luke’s is manned by a brusque but efficient woman. Even though she wasn’t particularly friendly to us, I’d take her any day over the intimidating and burly beasts working over at Pat’s and Geno’s. I ordered a cheesesteak with grilled onions and Cheez Whiz ($7.25), while the Astronomer went for another Philadelphia classic, a roast pork sandwich ($6.25). The sandwiches arrived rolled and wrapped in butcher paper. Both of my sandwich’s namesake components were totally right on. The steak, a pleasing cross between hacked bits and thin slices, was well seasoned and browned around the edges. The “cheese” didn’t possess the most appealing color, but it tasted fine enough and moistened the entire sandwich. 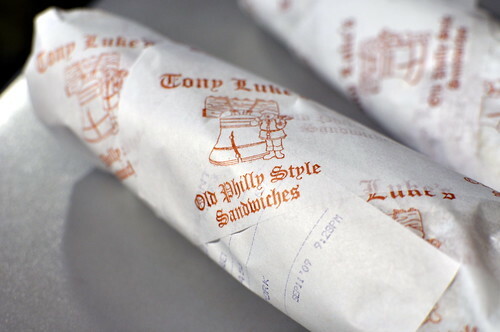 What’s especially noteworthy about Tony Luke’s creation is the bread. Soft, yet sturdy, the hefty Italian roll held every ingredient in place and gelled seamlessly with the meat, onions, and Whiz. With the weather so cold and my stomach so empty, I scarfed down this sandwich much too quickly. The Astronomer’s roast pork sandwich was served on the same Italian roll as my cheesesteak and filled with slices upon slices of moist and juicy pork. Unfortunately, The Astronomer passed on the Provolone and broccoli rabe this evening, which I think are absolutely essential. 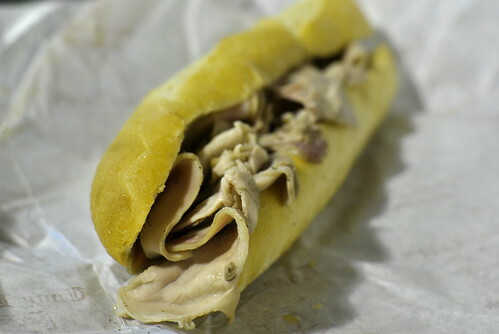 Roast pork sandwiches may not be as popular as cheesesteaks, but they’re seriously just as good. 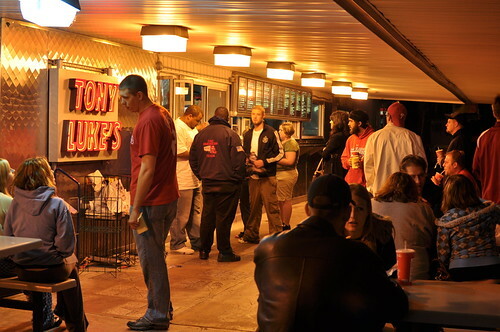 Tony Luke’s roast pork is even better than DiNic’s, which is located inside the Reading Terminal Market. After filling our gullets with authentic regional cuisine, The Astronomer and I met up with our old XC teammates for drinks at The Bards. I still can’t believe the Irish Pub was enforcing a cover charge. As if! Mmm. I’ve never had a cheesesteak in Philadelphia. My life is incomplete. Funny how much the success of the sandwich relies on bread – just like your explorations of bahn mi in LA (sorry if I misspell). 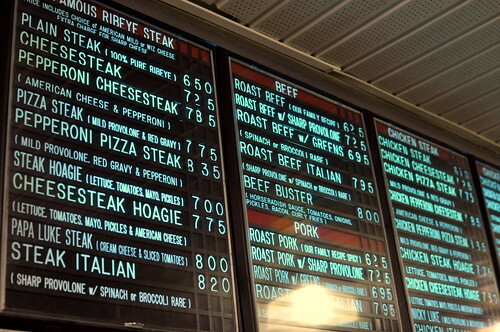 Meanwhile, I’m now jonesing for a cheesesteak, something I haven’t eaten in literally 20 years. Thank you! For acknowledging the truth about Pat’s and Geno’s! I’ve been to them once and it was so disappointing because there was so little meat and the employees were surly at best. Jim’s is great, and I hear the same about Ishkabibble. 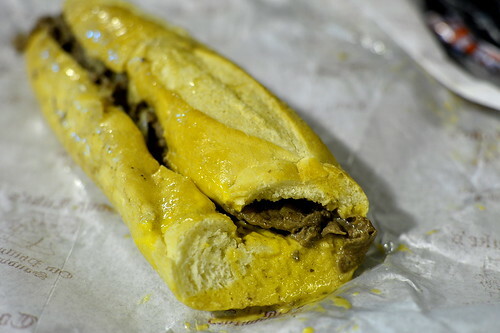 Mmm, I haven’t had a cheesesteak in awhile. 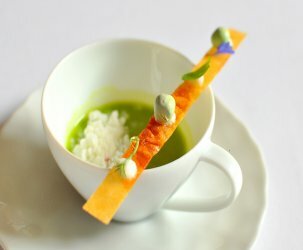 Gee whiz that looks tasty! Have you found any good places out here with a good cheesesteak? 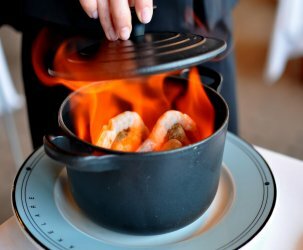 I think I actually just read about a place in Westwood that has ’em (complete with cheese whiz)! Right on! Tony Luke’s hits the spot when you’ve been away from the City too long. I also like the Uncle Mike Sandwich there – broccoli rabe, spinach and sharp provo. 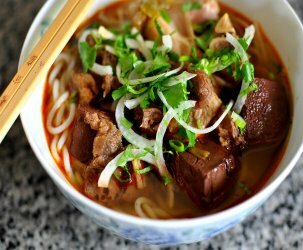 yuuuuum. Love your blog. Cheese whiz in a sandwich? Gee whiz. What a brill idea! I’m going home to try it now. I live in Philly and this makes me crave a cheesesteak for lunch! heehee intimidating and burly beasts… sometimes the best places have the worst gatekeepers eh? Looks like a deliciously gooey cheesy sandwich. I think the roast pork with broccoli rabe and aged provolone is my favorite sandwich in the world. And I agree that Tony Luke’s has by far a better cheesesteak than Pat’s or Geno’s (although I think I’ll take the White House’s in Atlantic City over either of them). Tony Luke’s is a treasure. Dude,you are from LA and not one mention of Persian food in LA?Go to Shamshiri grill on westwood Blvd(across from Ross store) and then you will know what food really is.